The Maroone Cancer Center at Cleveland Clinic Florida is seeking applicants with expertise in Hematologic Oncology for a full time faculty position. The ideal candidate will have several years of clinical experience in managing both hematology and oncology diseases. Additional training and expertise in Bone Marrow Transplantation is preferred. The successful candidate must be board certified in Hematology and will be responsible for building an active clinical practice in malignant/benign hematology and participating in active research programs working in a multidisciplinary approach with colleagues in numerous specialties. The Maroone Cancer Center in Florida is closely aligned with the Taussig Cancer Institute at the Cleveland Clinic in Ohio. The Cancer Center recently opened a new 140,000 square foot ambulatory facility for oncology, radiation therapy, and neurological sciences. Research studies are available through both sponsored and cooperative group protocols. Academic appointments are offered through the Cleveland Clinic Florida. Cleveland Clinic Florida is a multi-specialty academic group practice affiliated with the Cleveland Clinic in Ohio. We are a state-of-the-art Medical Center and Hospital located in South Florida, one of the largest metropolitan areas in the southeastern United States. 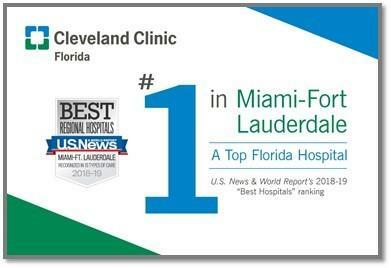 Cleveland Clinic Florida ranked #1 in the Miami- Fort Lauderdale metropolitan area in the 2018-2019 annual survey of best hospitals by US News & World Report. For over 75 years, Cleveland Clinic has been committed to the improvements in patient care, enhancements in medical education and breakthroughs in medical research. The tradition continues here in the Southeast with Cleveland Clinic Florida in Weston. Continuing the world-renowned tradition of Cleveland Clinic, Cleveland Clinic Florida physicians excel at the diagnosis and treatment of medical problems that are complex or difficult to treat. Cleveland Clinic Florida is a not-for-profit, multispecialty group practice dedicated to providing outstanding, state-of-the-art medical care. Cleveland Clinic Florida physicians are carefully selected for their credentials and training. All have Florida licenses and are board certified or board eligible in one or more specialties. They are salaried and receive no compensation for the number of patients they see or tests they order. Cleveland Clinic Florida physicians focus on treating the patient, not just the disease. Working together, they provide comprehensive diagnoses and coordinated treatment. Proximity of offices and examination rooms, collegial collaboration and strict peer review, ensure high-quality, cost-effective and well-coordinated care – a tremendous advantage to patients who require the services of more than one physician. This care and concern is supported by state-of-the-art technology and dynamic research and medical education programs. For these reasons, patients travel to Cleveland Clinic Florida from all over the United States and many foreign countries.